An unmarked Chicago police vehicle was involved in a crash at 83rd Street and Halsted Avenue Wednesday morning. 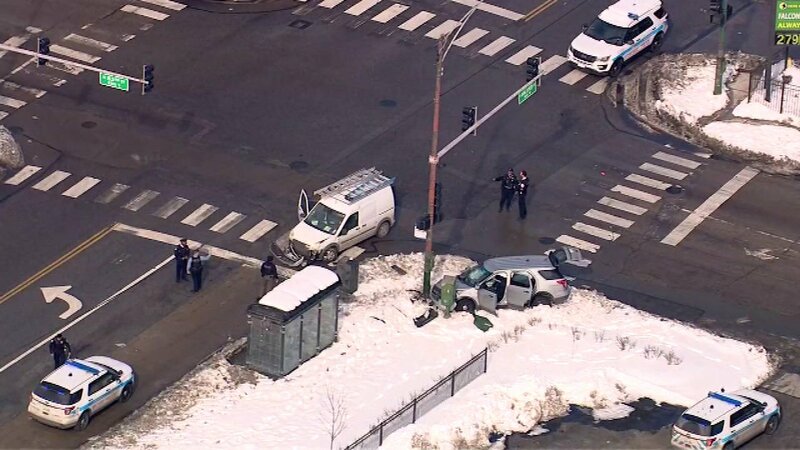 CHICAGO (WLS) -- Three Chicago police officers were injured after a crash in the Auburn Gresham neighborhood Wednesday morning. The officers were in an unmarked police car on their way to a robbery in progress in the 200-block of West 87th Street at about 10:18 a.m. The police car, which was using its emergency equipment, was behind a van attempted to pass the van on its left. The van was making a left turn and struck the squad car in the intersection at 83rd Street and Halsted Street. The police car then struck a light pole. The three police officers were transported to Advocate Christ Hospital, one in serious condition and two others in stable condition. The van driver was not injured.